Had some happy post this morning - the new Craftwork Cards Iconic Christmas Kit and I LOOOOOOOOOOVE it! This is the first card I have made with the kit which includes the wreath stamp, ribbon, candi, sentiments, cardstock and envelopes. I coloured the image using promarkers and then added stickles and glossy accents to highlight a few of the baubles. I added a few little buttons of my own that toned quite well with the colours I used. Think it will definitely be a Candi kind of Christmas for me this year! Gorgeous and loving the buttons on the wreath too. 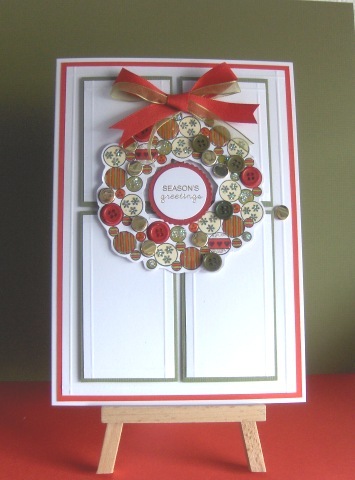 This is is lovely -the buttons look great , I really do like wreath cards for Christmas.